COLLEGE STATION, Texas — Junior John Doxakis weaved a gem as the No. 12 Texas A&M Aggies blanked the No. 19 Auburn Tigers, 4-0, in Friday’s series opener on Olsen Field at Blue Bell Park. Doxakis (4-2) worked 8.0 innings, scattering seven hits and two walks while striking out six. 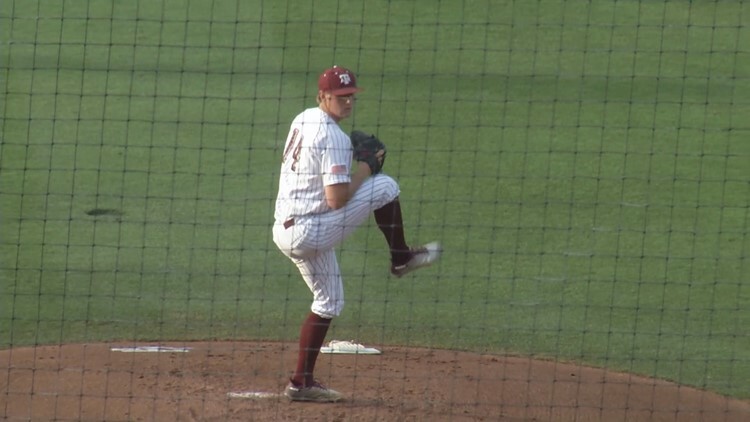 The Aggie left-hander earned the win going toe-to-toe with Auburn’s ace Tanner Burns who entered the fray with a 1.76 ERA and .169 opponent batting average. It marked the second time Doxakis has outdueled one of the Tigers’ top guns. Last year, he bested eventual MLB No. 1 overall draft pick Casey Mize at the SEC Tournament, taking a no-hitter into the eighth inning. The Aggies made the most of their eight hits, including four doubles. Chandler Morris batted 2-for-4 with one run and one RBI. Braden Shewmake hit 2-for-3 with one walk, one double and one run scored. Mikey Hoehner was 1-for-4 with a two-run double. Texas A&M improved to 26-9-1 overall and 8-4-1 in league play. Auburn dropped to 23-11 overall and 7-6 in SEC action. The Aggies and Tigers return to action for game two of the series Saturday at 4:02 p.m.
B4 | The fourth inning continued to be the Aggies’ money frame as they’ve outscored opponents 45-7 in the inning. With one out, Chandler Morris singled to leftfield and advanced to second on a wild pitch. Braden Shewmake drew a four-pitch walk and both runners scored when Mikey Hoehner hit a wall-banger to leftfield for a double. A&M 2, AUB 0. B5 | Will Frizzell drove a single through the left side of the infield, moved to second on a grounder back to the pitcher, advanced to third on a wild pitch and scored on a sacrifice fly by Zach DeLoach. A&M 3, AUB 0. B8 | Bryce Blaum gapped a double to left-center and came around to score when Morris punched a single into leftfield. A&M 4, AUB 0.